Hi everyone, I have some very exciting news to share today! 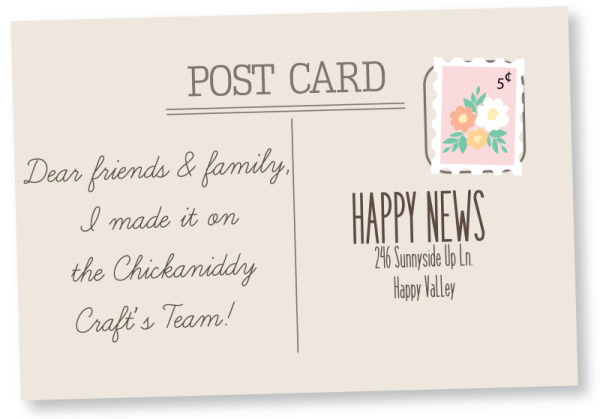 I am so excited and honored to be joining the Chickaniddy Crafts Design Team! Everything about this company is CUTE CUTE CUTE and just my style! It's a fun team of incredibly talented ladies and I can't wait to see what wonderful things they create with all the gorgeous Chickaniddy projects! Heidi is a sweet and amazing woman and she is going to create wonderful things with this awesome company of hers! I'm looking forward to sharing Chickaniddy projects with you in the coming months! yeah! Looking forward to working with you! Yay, Allie!! I'm so excited to be working with you! Your style is just amazing, and this is such an awesome opportunity! Woo hoo!! Really love your creations! So happy to be in this team with you! Congrats!! Way to go Allie!! I'm so excited to see all your beautiful layouts!! So awesome Allie!! Big congrats and I can't wait to see what you create with the new Chickaniddy collections!! congrats! glad we are on the same team..
Congrats! It is so amazing and I love your layouts - I can't wait so se your creations with this collections!